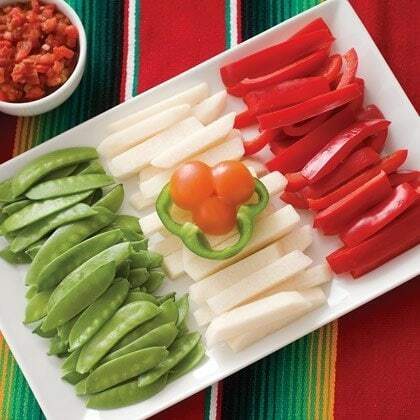 Cinco De Mayo…. To the Revolution!!!! Here are some new Cinco De Mayo Cocktail Recipes I’d like to share with you. Using a paring knife cut a hole in the top of the watermelon that is deep and wide enough to insert a kitchen funnel, keep the watermelon plug. Insert the funnel into the watermelon and pour as much room temperature tequila as can be absorbed, approximately ½ cup to 1 cup. Remove the funnel and insert the reserved watermelon plug. Let sit at room temperature for 3 to 4 hours and then pour in another ½ to 1 cup of tequila and let sit again for another 3 to 4 hours. 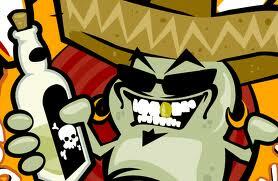 Repeat as necessary until all the tequila has been completely absorbed. Place watermelon in the refrigerator till it becomes ice cold. Spread out a layer of coarse infused salt onto a small plate and a second plate with the juice from the 2 limes and unused citrus juice from the salt infusing process. To serve place the melon slices and soak them into the citrus juice mix and then sprinkle the infused salt to taste. I personally prefer to split the melons into three groups; naked (no salt), orange chili infused salt, and lime infused salt. The combination of the sweet melon, chili, salt, citrus and tequila is lip smacking good!!! Preheat the oven to 225 degrees Fahrenheit, with a rack in the center. Grate the bright green zest off of 3 large limes (make sure the limes have been stored and used at room temperature if you can) being careful to avoid the bitter white pith underneath, into the salt (doing this over the bowl of salt ensures that you capture as much of the citrus oil released while grating as possible). Combine the lime zest and salt on a baking sheet, tossing to combine. Spread the mixture into an even layer and bake at 225 degrees Fahrenheit for two hours, turning once after the first hour. After two hours, remove the baking sheet from the oven and break up any clumps that may have formed. Transfer the salt to airtight jars and store in a cool, dark place. Preheat the oven to 225 degrees Fahrenheit, with a rack in the center. Grate the bright orange zest off of 2 large oranges (make sure the limes have been stored and used at room temperature if you can) being careful to avoid the bitter white pith underneath, into the salt (doing this over the bowl of salt ensures that you capture as much of the citrus oil released while grating as possible). Combine the orange zest, chili powder and salt on a baking sheet, tossing to combine. Spread the mixture into an even layer and bake at 225 degrees Fahrenheit for two hours, turning once after the first hour. After two hours, remove the baking sheet from the oven and break up any clumps that may have formed. Transfer the salt to airtight jars and store in a cool, dark place. The infused salt will keep for up to six months. Watermelon with seeds is best; however seedless watermelon works well too. The sweetness will have to be tweaked (seedless are less sweet). Keep unused limes and oranges for later. Place all ingredients in a blender and process until smooth. However, I prefer to add only 8 tablespoons of sugar in the beginning and taste (add more if necessary). Place juice into a pitcher and refrigerate. When serving; pour over ice with a mint sprig as a garnish. This drink is excellent as non-alcoholic beverage or as a mixer for your favorite liquor. Pour all the liquid ingredients into a cocktail shaker with ice cubes. Shake vigorously then pour all ingredients including ice into a glass. Garnish with a lime twist. Spread out a layer of coarse sea salt or kosher salt onto a small plate. Take a lime wedge and run it around the rim of a stemmed martini glass. Place the lime soaked rim into the salt. Move the glass around in the salt until the rim is evenly coated then place prepped glasses in freezer. Mix all ingredients together in a shaker and chill. Add crushed ice and shake until ice cold and then strain into salted rimmed prepped stemmed glasses and then garnish with lime wheels. For a slight different taste…. Try the infused salts!! Or substitute honey for agave syrup. Remember not to drink and drive!!!! Wow, these recipes all sound delicious! 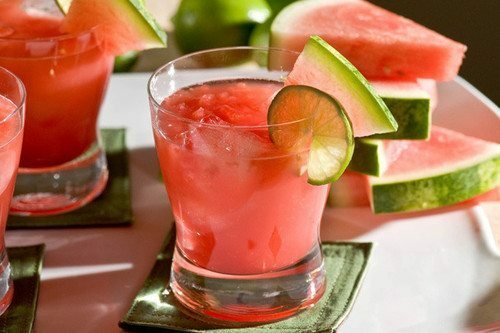 And that Agua Fresca one with the watermelon and lime is perfect as a non-alcoholic option. All great for upcoming summer parties! I’m glad you enjoy them…. 🙂 with summer here I’m looking forward to posting future sangria recipes. Thank you for sharing some non-alcoholic versions!